For the sauce: Place 1 tablespoon of vegetable oil in a small pot over a medium flame and allow oil to get hot. Add in tomatoes, onion and garlic. Cook in oil for 7 minutes. Add in tomato sauce, 1/8 teaspoon of salt. Mix until all ingredients come together. Lower flame and simmer. For the burrito: Remove chiles from can and pat dry. Carefully stuff the center of each chile with a stick of cheddar cheese. Roll each stuffed chiles in flour. Remove chiles from flour and set on a cooling rack for flour to set while you make the egg batter. In a mixer set on high, whisk egg whites until they form a peak about 3 minutes. Carefully add in the yolks and mix until combined. In a large frying pan add in 2 cups of vegetable oil over a medium flame. Allow to heat for about 3 minutes. Drop each stuffed and floured chile in egg batter. Fry one at a time until golden crisp on the outside. Remove chile relleno from oil and place on a paper towel lined plate to drain excess oil. Heat a flour tortilla on a comal or open flame. 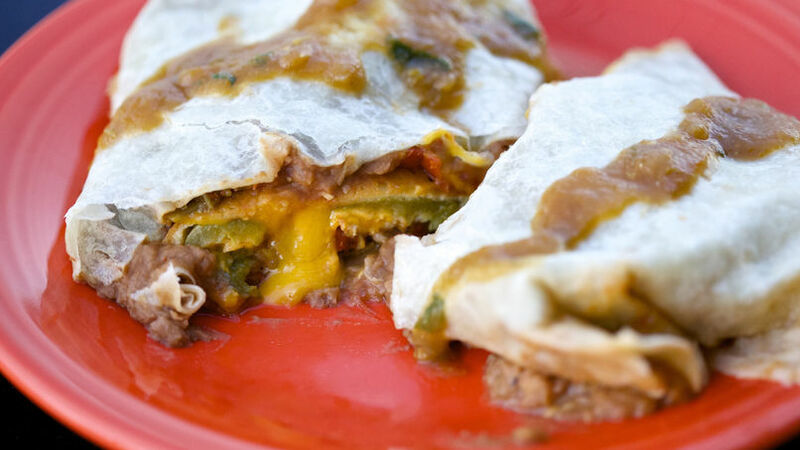 Spread a thin layer of refried beans on the inside of the tortilla and place a chile relleno in the center. Fold both the top and bottom end of the tortilla toward the center, then roll the left side of the tortilla toward the right side. Pour sauce over the top. Serve and enjoy! Chile rellenos freeze really well and could be defrosted at any moment to make a fast burrito dinner. When I was a kid, my aunt Rosie used to make chile stuffed burritos for her husband quite often. I loved spending time with her in the kitchen and that how I learned to master them. She used to make a large batch every time she made them because that way she could put a bunch in the freezer for later. Give them a try and surprise your loved ones with delicious chile goodness!